It's Wednesday and that means it's Color Throwdown Challenge time! This week, Lori Tecler has a great color palette for us...inspired by this beautiful room! My card layout was inspired by one of my fave stampers, Bridget Finlay. I had intentions of linking her card here and could not find it in her SCS gallery. Anyhoo...I went with an oldie but goodie stamp set retired from SU - Terrific Tulips. I stamped off once using Daffodil Delight ink for Step 1 of the tulip image, then stamped the Step 2 image using Daffodil Delight ink without stamping off first. The leaves were stamped using Old Olive and Kiwi Kiss inks. DP is a retired collection - Island Oasis - by SU. The scallop and postage stamp borders are Die-Namics by MFT. Sentiment is from Verve's Joyful Blooms set. We'd love to have you join us! No worries if you don't have the exact colors... feel free to substitute colors that are close! Make a card or paper crafted project and post it to your blog or online gallery. Then use the direct link and link it to the Color Throwdown blog using the Inlinkz tool at the bottom of the CTD post. If you post to an online gallery, please use CTD190 as your keyword. So...are you ready to be inspired?? Check out what the other CTD designers, along with our talented May guestie, Kittie Caracciolo, have created by clicking HERE! I'm a long time follower of Kittie's gorgeous floral creations, so look forward to having her join us! Welcome, Kittie! Love how you cut out the tulips and lovely layout of the sentiment panel. Wanda this is such a pretty Mother's Day card! The yellow tulips just pop and I really like this layout! Wanda, I love your tulips and a perfect Mother's Day card. Thank you for your sweet comment. Hugs! Gorgeous big and bold tulips! I love this layout and your background paper is perfect Wanda! Oh, Wanda, I'm very touched by your sweet words, it means a lot coming from someone as talented as you! 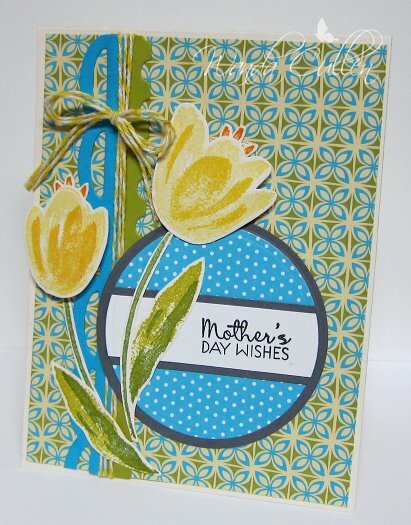 I recognize the layout, it was from the first batch of my DD cards last April...and I just LOVE your beautiful card...what a perfect Mother's Day creation! I love your use of the 2-step stamps, Wanda, and the cute little peeks of orange!! What a beautiful card! Love, love, love your tulips, Wanda!!! That SU set is one of my favorites and it looks sooo pretty with this weeks colors!!!! I'll have to pull mine out and play with it this week!!! Lovely Mother's Day card, Wanda! The yellow tulips really pop against the patterned paper.